An herb traditionally used to soothe the stomach after meals, and flavor cured salmon, borscht and other soups, pickles, and dips. It can be used either fresh or dried. Dill seed is the fruit of the plant, while dill weed is the leaf and stem of the dill plant. Dill seeds taste like a mild version of caraway. In Lao cuisine and areas of northern Vietnam and Thailand dill is known in English as "Laotian coriander" and "Lao cilantro" (Lao: ຜັກຊີ, Thai: ผักชีลาว, Vietnamese: Thì là). In Lao it's called Phak See and in Thai it's known as Phak Chee Lao. In Lao cuisine, the herb is typically used in coconut milk-based curries (that have fish or prawns) and mok pa (steamed fish in banana leaf). Lao coriander is also an essential ingredient in Vietnamese dishes like chả cá and canh cá thì là. Cultivation needs warm to hot summers with a lot of sun; even a little shade will substantially reduce the harvest. It also likes rich, well drained soil. The seeds are last for 3–10 years. The seeds are harvested by snipping the flower heads off of the stalks when the seeds are beginning to ripen. The seed heads are put upside down in a paper bag and left in a warm dry place for a week. The seeds then easily separate from the stems and are stored in airtight containers. Choosing: Whenever possible, choose fresh dillweed over the dried form of the herb since it is superior in its delicate fragrant flavor. The leaves of fresh dill should look feathery and green in color. Dill leaves that are a little wilted are still acceptable since they usually droop very quickly after being picked. Buying: Fresh dill weed is widely available in the produce department of most markets. The leaves wilt quickly upon harvesting, but this will not affect flavor. * Dill plants can grow quite large, ranging from 2-3 feet high, so plan accordingly, especially if dill is part of a decorative garden or landscape. * Dill is an annual herb and will have to be replanted each year. This makes it flexible for planting as you can change your location each year if necessary. * Dill can be grown almost anywhere. It can tolerate wet or dry areas and rich or poor soil. These plants can even be grown in water using hydroponics! * An area with adequate drainage and full sun is preferable for the best plant growth. * Dill with grow in nearly any soil, but certain soil conditions will help yield a healthier, more productive plant. * The soil should be well-worked and moderately rich. This can be achieved by mixing in rotted compost or organic material. * The pH level of the soil can be fairly acidic, as low as 5.5 all the way up to 7.5. Soil testing kits are available through your local garden supply or home improvement store. 1. Dill seeds should be sown after the last frost. 2. Properly prepare the soil before planting. 3. Space rows approximately 12 inches apart. 4. Scatter the seeds along the ground and cover lightly with a small layer of soil. Be cautious not to place the seeds too deep, about ¼ inch should be sufficient. 5. Water thoroughly immediately after planting and keep moist until plants begin to sprout. 6. Once seedlings have developed, thin plants to 9 inches apart. 7. Fertilizer once or twice during the growing season with an all-purpose fertilizer. 8. During dry spells it will be necessary to water your plants once or twice a week. Both the leaves as well as the seeds of the dill plant can be harvested for use. The dark leaves are called dill weed and can be used for seasoning, however, the young, tender leaves often are more flavorful. Harvesting will need to be done often as this plant grows quickly. 1. Harvest leaves by cutting with scissors once they reach mature size to use with many dishes including cucumber dishes, salads, soups, fish and dips. 2. Leaves can be cut and used fresh or frozen in Ziploc bags for future use. 3. If you wish to harvest seeds (a must for homemade pickles! ), leave the plant untrimmed to allow flowers to form. 4. Flower heads will fade into seed pods and should be removed once the seed pod turns brown and has died. Remove each head and place on a wire rack to dry. Place a tray or bag underneath to catch any seeds that may fall throughout the drying process. When the heads are completely dry, shake gently to remove any remaining seeds. Spritz whole stems lightly with a fine spray of water, wrap loosely in paper towels, and place in a plastic bag. Store in the vegetable bin of your refrigerator. It should last up to a week and perhaps even longer. You can also trim the stems, place in a glass with an inch of cold water, loosely wrap the top with a damp paper towel, and invert a plastic bag over the top before storing in the refrigerator. Fresh dill sprigs can be frozen for up to two months, but be prepared for it to darken a bit in color. No need to thaw it before using. Frozen dill weed will still have more flavor than dried dill. Dill seed is available dried in the spice section. Store dill seed in a cool, dry, dark place and use within six months for best flavor. Dill seed is a very good source of calcium, and a good source of the minerals manganese and iron. 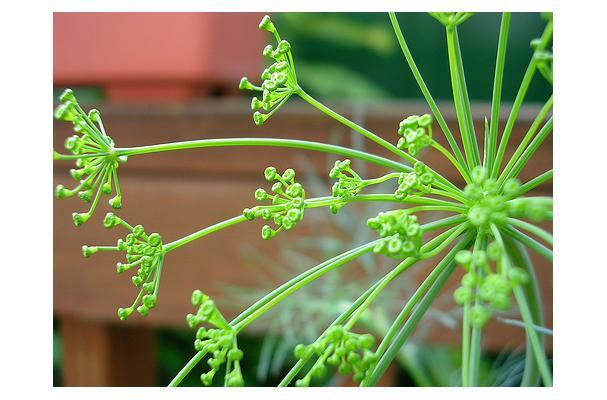 History: Botanically known as Anethum graveolens, dill weed is a member of the parsley family. It is native to the eastern Mediterranean region and western Asia. The word dill comes from the old Norse word dylla, meaning to soothe or lull. It dates back in writing to about 3000 B.C., where it was mentioned in Egyptian medical texts.